On February 4th, 2018, Syrian opposition organisation Hayat Tahrir al-Sham (HTS) released a new propaganda video entitled “100+ Yawm”, or “100+ Days”. The piece, whose release followed nearly four months of fighting in eastern Idlib and northern Hama province, is markedly different from the average HTS propaganda releases of 2017. Rather, “100+ Days” echoes themes and patterns increasingly seen in media releases from more recent months. The video appears to be a calculated attempt to shift the theme of their propaganda efforts towards acceptance of the current political and military situation. The new release places emphasis on continued resistance despite sustained battlefield losses, and echoes themes seen in a previous HTS media piece, “In the Shadow of Victory”. The “100+ Days” propaganda piece opens with the sounds of heavy gunfire over footage from the fighting around Abu Dali in early October, where opposition and government elements clashed over control of a key black-market town in northeastern Hama province.1.LiveUAMap A narrative is immediately presented, as simple white Arabic lettering over a black background announces that “Beginning in October…in a clear message against the Astana conference, the mujahideen captured the villages of Mushayrifa and Abu Dali and al-Huwajir outskirts.” Footage of clashes with the Islamic State (IS) organization throughout the months of October and November is shown next. 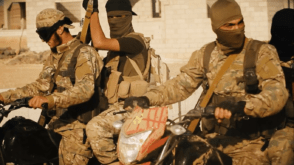 The accompanying text accuses government forces of allowing IS fighters in the eastern Hama pocket to travel farther west, and refers to the escaping IS elements as khawarij in typical fashion. HTS fighters on motorcycles prepare to deploy into battle, as seen in “100+ Days”. 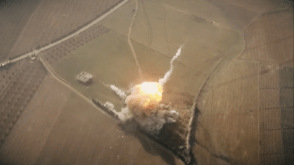 The narration proceeds to discuss the events of November and December, highlighting the successes of HTS and allied opposition forces on the ground against belligerent government units. At this point two audio elements become prominent as they play alongside the footage of the battles around Abu Dali and, later, Abu Duhour. The first audio element is a voice-over of HTS military leader, Abu Mohammed al-Jolani, taken from a previous speech of his directed towards forces under his command. The second audio element is a proto-nashid that contains no Arabic, but is defined by dramatic, repetitive a cappella vocalisation that grows in intensity as the footage progresses. This is a departure from audio themes normally prominent in HTS productions, which have previously utilized anashid that transmits a message of violent Salafist resistance. The proto-nashid used in “100+ Days” appears to contain no such message, but through its menacing chanting and bass undertones, insinuates that the conflict has entered a new phase where victory and glory are now distant memories. The propaganda comes to a conclusion with the narration insisting that “the battle is not decided yet…nor will the mujahideen cross [the] epics up to this moment.” While the full translation of this final message seems somewhat vague, it clearly states that defeat is not yet at hand and that there is no giving up. This final piece of narration, juxtaposed with Jolani’s voiceover and footage of a single car bomb detonating at a checkpoint held by government-aligned militias, falls in line with what has been seen in the November 2017 release, In the Shadow of Victory. Said propaganda piece, which urged fighters to continue their struggle even though defeat was still prominent in the minds of many, is similar in tone and theme to “100+ Days”. The latter carries over the themes of continued resistance and the reality of failure and loss, but since “100+ Days” is roughly a quarter of the length of In the Shadow of Victory it is unable to cover as much ground. The single SVBIED featured in “100+ Days”. In a further departure from typical HTS publications, “100+ Days” makes no effort to blame other rebel factions for their territorial losses. Although harsh rhetoric flew between HTS and FSA factions in early January as each side blamed the other for not doing enough to halt the government advance, this dissent receives no mention in the video.4.“Syrian rebel losses do not mean victory for Assad” : Alaraby The absence of this detail in “100+ Days” underpins the strange space that HTS occupies as both a genuine attempt at opposition unification and a failure to reign in Jabhat al-Nusra. “100+ Days” may mark the start of a new era of HTS propaganda, which purposefully undresses itself and reveals the raw substance beneath. It marks a definitive shift from victory to insurgency and resilience. The absence of typical anashid, or lengthy oration, leaves only the pounding of artillery and crack of bullets to accompany the simple, violent visuals. The brutal and drab footage is punctuated only by brief descriptors relaying in straightforward terms the hard fought battles the “mujahideen” endured. It is four minutes of raw war juxtaposed with a reality defined by defeat and sacrifice. This article is presented as a collaboration between Trent Schoenborn and Gregory Waters. The latter’s work with the International Review can be found archived here. 2. ↑ Note on Miskeen: access to this material will not be publicly linked due to the nature of its content.